Everything you need to know when buying new tires!! You probably know tires are made of rubber, but how much more do you really know? Here's a breakdown of some important tire-related terminology. This technical-sounding term refers to the relationship between the width of a tire and the height of the tire's sidewall. High-performance "low profile" tires have low aspect ratios, their sidewalls are short relative to their width. This provides extra stiffness and better high-speed handling and grip but also tends to result in a firmer (and sometimes, harsh) ride. "Taller" tires tend to provide a smoother ride and better traction in snow. An alpha-numeric symbol you'll find on your tire's sidewall that tells you the maximum sustained speed the tire is capable of safely handling. An H-rated tire, for example, is built to be safe for continuous operation at speeds up to 130 mph. Most current model year family-type cars have S (112 mph) or T (118 mph) speed ratings. 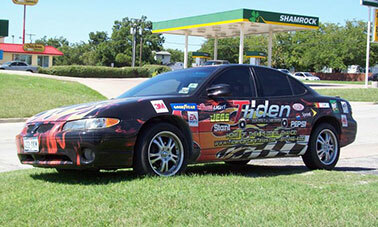 High performance cars often have tires with a V (149 mph) or ZR (in excess of 149 mph) speed rating. A few ultra-performance cars have W (168 mph) and even Y (186 mph) speed-rated tires. This refers to the maximum load that can be carried with a given type of tires and the maximum air pressure needed to support that load. In your vehicle's owner's manual, you should be able to find the recommended cold inflation load limit. It's important not to exceed the load limit (or over or under-inflate the tires) as this can lead to stability/handling problems and even tire failure. Always check tire pressure "cold." Driving creates friction which creates heat; as the tires warm up, the air inside expands, increasing the pressure. Measuring air pressure after driving can give a false reading; you may actually be driving around on under-inflated tires. This number corresponds to the load carrying capacity of the tire. The higher the number, the higher the load it can safely handle. As an example, a tire with a load index of 89 can safely handle 1,279 pounds while a tire with a load rating of 100 can safely handle as much as 1,764 pounds. It's important to stick with tires that have at least the same load rating as the tires that came originally with the vehicle, especially if it's a truck used to haul heavy loads or pull a trailer. It's OK to go with tires that have a higher load rating than the original tires. However, be careful to avoid tires with a lower load rating than specified for your vehicle, even if they are less expensive. Saving a few bucks on tires is not worth risking an accident caused by tire failure. Bias-ply tires have their underlying plies laid at alternate angles less than 90 degrees to the center line of the tread; radials have their plies laid at 90 degrees to the center line of the tread. That's the technical difference. The reason radial tires are dominant today is that they help improve fuel efficiency and handling; they also tend to dissipate heat better than bias-ply tires. No modern passenger cars come with bias-ply tires and their use is generally not recommended. (Exception might include older/antique vehicles that originally came equipped with bias-ply tires. Some RVs also used bias-ply tires.) It is important to never mix radial and bias-ply tires; dangerously erratic handling may result. The LT designations refers to "light truck" and is used on tires that were designed for use on light trucks. These tires are built to withstand heavier load carrying capacities and higher inflation pressures than passenger car tires. The M+S designation refers to "mud & snow" and was originally used to describe tires with a knobby tread, good for muddy or snow covered roads. As tire technology improved and all-season tires became popular, the M+S designation migrated over to all-season passenger car tires that also offered a specific level of performance in snow conditions. Many modern cars come with so-called "space-saver" tires which are smaller and lighter than a standard or full-size spare tire. They are designed to leave more room in the trunk and be easier for the average person to handle when a roadside tire change becomes necessary. However, they are not designed to be used for extended (or high-speed) driving. Your car will probably not handle (or stop) as well while the space-saver tire is on. You should keep your speed under 55 mph and avoid driving on the tire beyond what's absolutely necessary to find a tire repair shop. Each tire has three separate ratings for tread wear, traction and temperature. Traction ratings run from AA to A to B and C with C being the lowest. The ratings represent the tire's ability to stop on wet pavement under controlled testing conducted by the government. C-rated tires are marginal and should be avoided. Never buy a tire with a traction rating that isn't at least equal to the minimum rating specified by the manufacturer of your vehicle. Temperature ratings run from A to B to C, with C being the minimum allowable for passenger car tires. The ratings correspond to a tire's ability to dissipate heat under load; tires with lower ratings are more prone to heat-induced failure, especially if driven at high speeds (or when overloaded). As with traction ratings, never buy a tire with a temperature rating that's less than specified for your vehicle.